Examine these slide at low power first to find the field which best demonstrates the listed features. 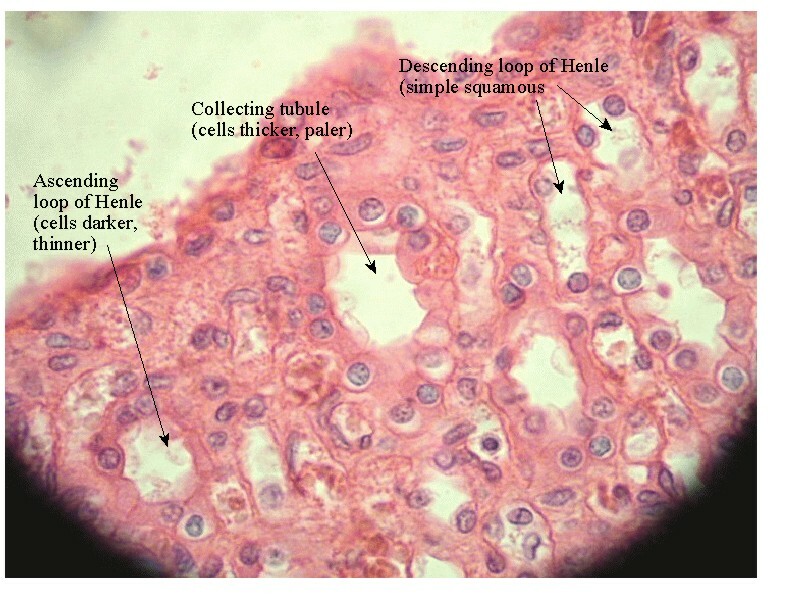 Label the indicated features, and briefly describe their functions. 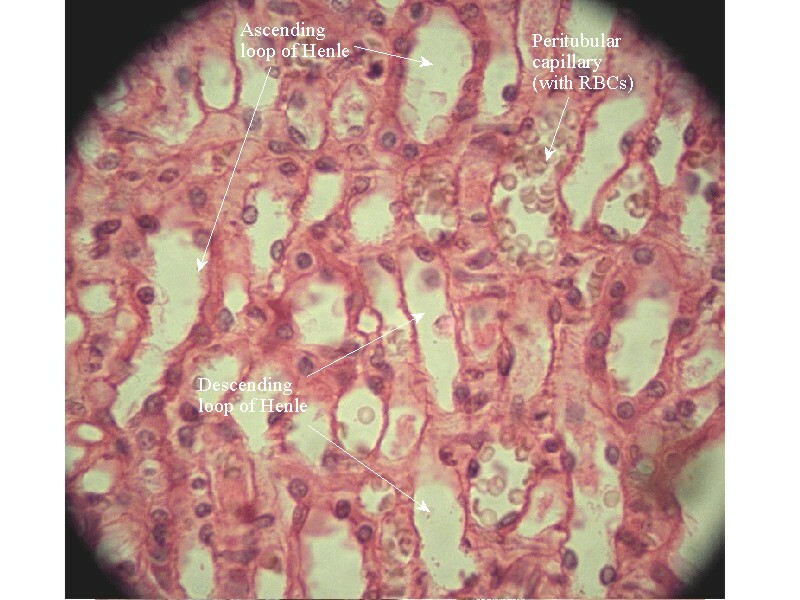 Make the following three illustrations showing the histology of the urinary tract. 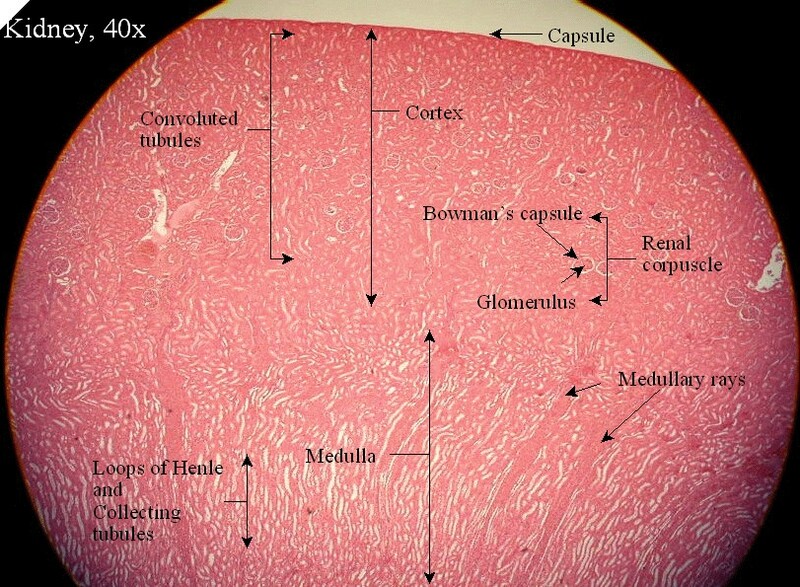 medulla Here is a labeled view of the 40x kidney. Here is a labeled view of the 400x cortex . Synthesizes renin in response to low blood volume or low blood pressure. Renin then converts angiotensinogen to angiotensin. 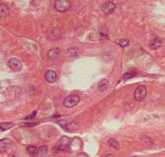 Angiotensin stimulates the adrenal cortex to release aldosterone. Aldosterone stimulates synthesis of Na?K pump in the ascending loop of Henle. 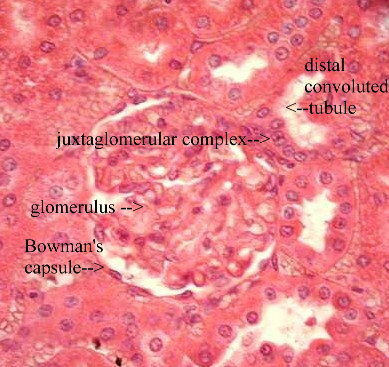 Here is a labeled view of the juxtaglomerular complex . And another labeled view of a juxtaglomerular complex . and yet another labeled view of a juxtaglomerular complex! Here is a labeled view of the 400x medulla . And another labeled view of the 400x medulla contrasting the descending and ascending arms of the loop of Henle. 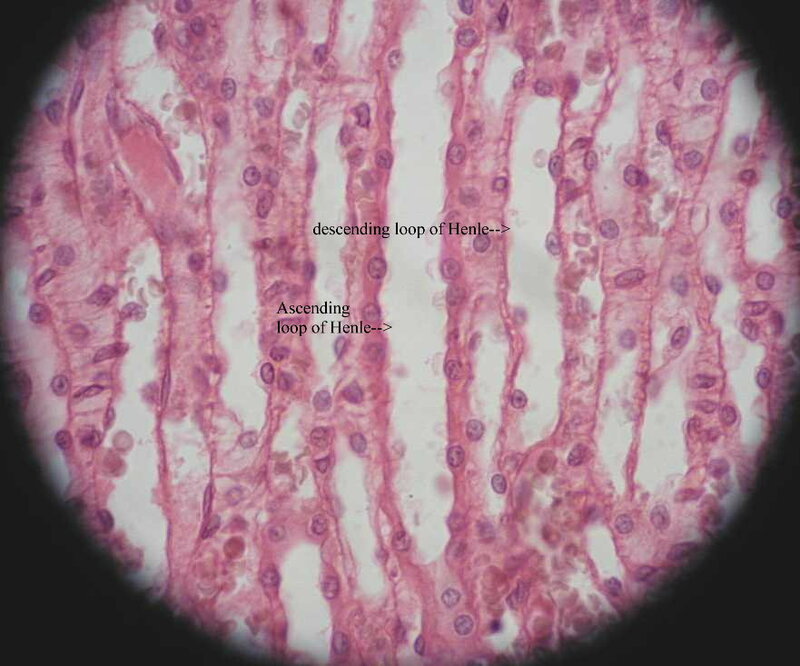 And another contrasting the collecting tubule with the arms of the loop of Henle . 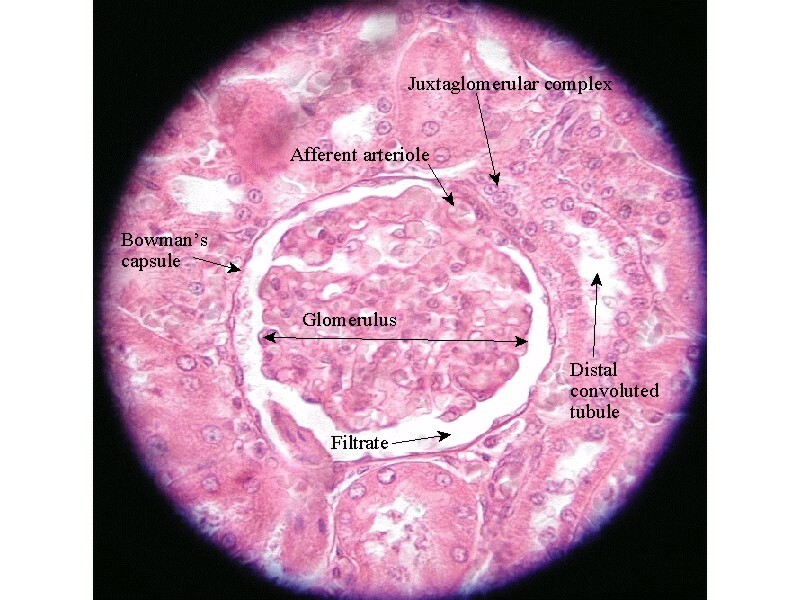 Here are additional images of renal histology. Identify the following organs of the urinary tract in the cat and illustrate their structures and positions in the rear abdominal wall. 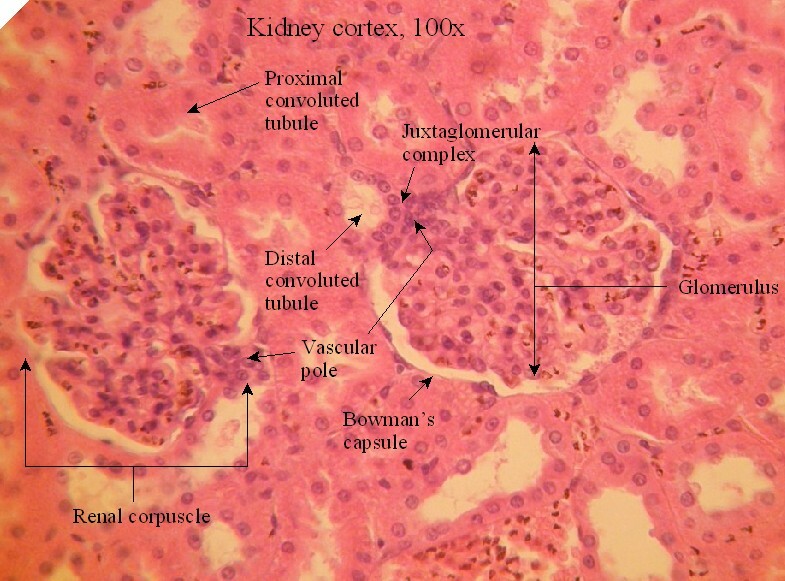 Here is a diagram of the urinary tract. 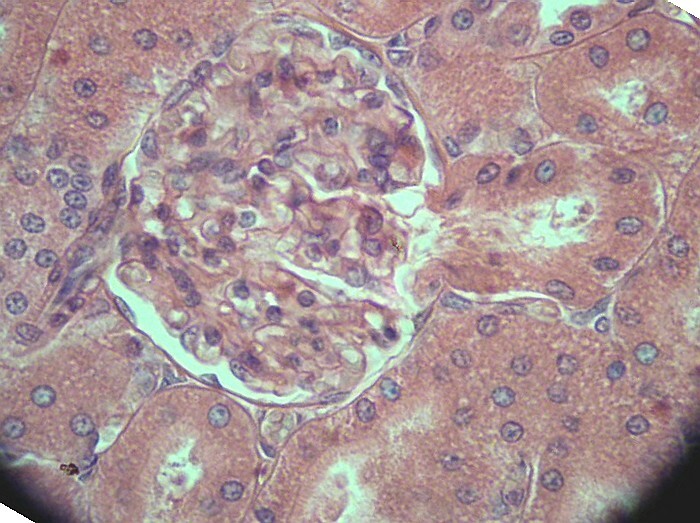 Right kidney, surrounded by adipose capsule of brown fat, covered by the peritoneum (it is a retroperitoneal organ). 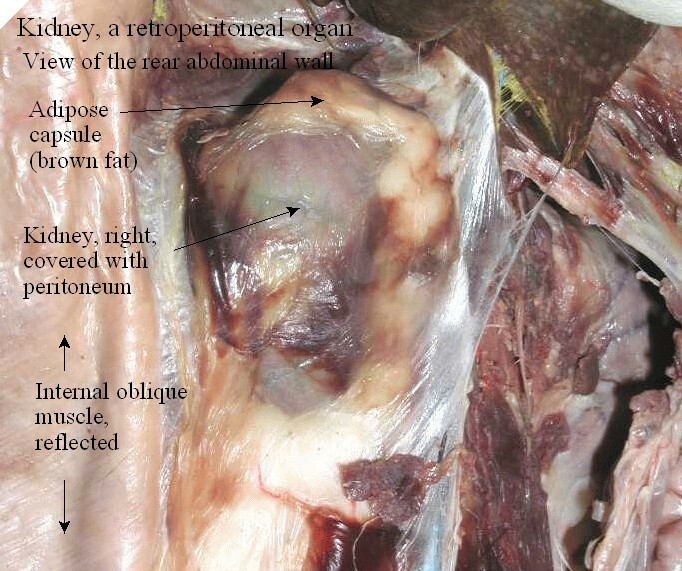 Here is a labeled view of a rear abdominal wall. 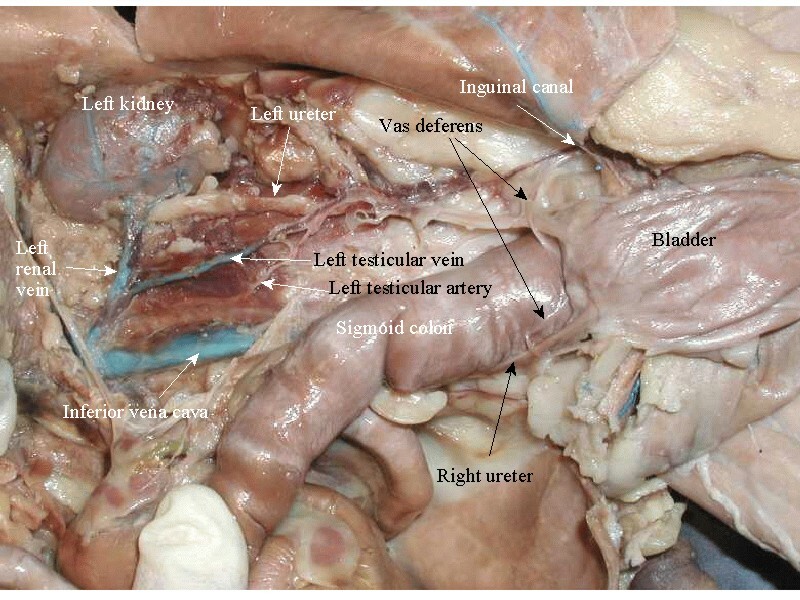 Left kidney, surrounded by fat, left renal artery drains it into the inferior vena cava. 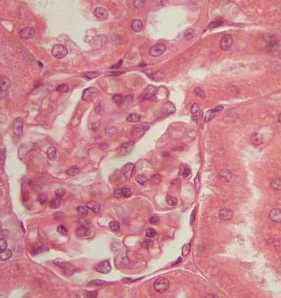 The left gonadal vein can be seen conecting to the left renal artery. 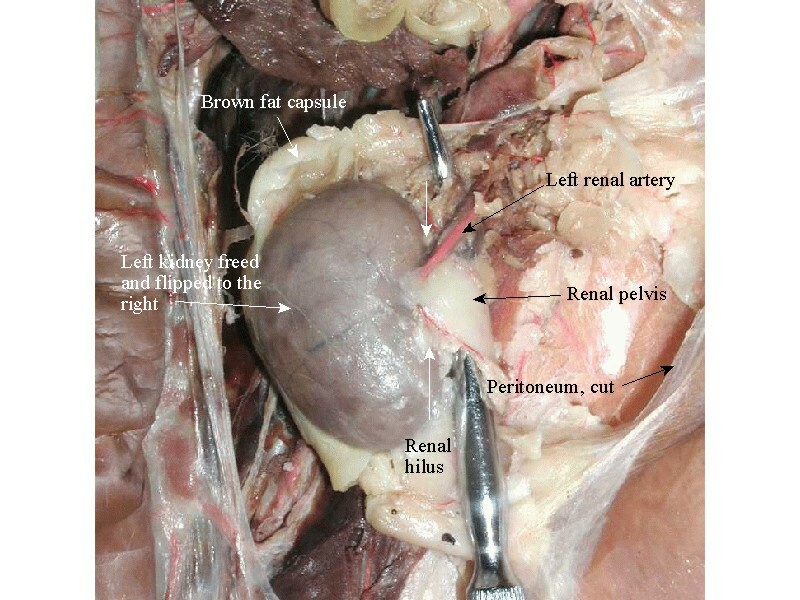 Left kidney freed of fat and turned over to reveal the renal pelvis and the left renal artery. 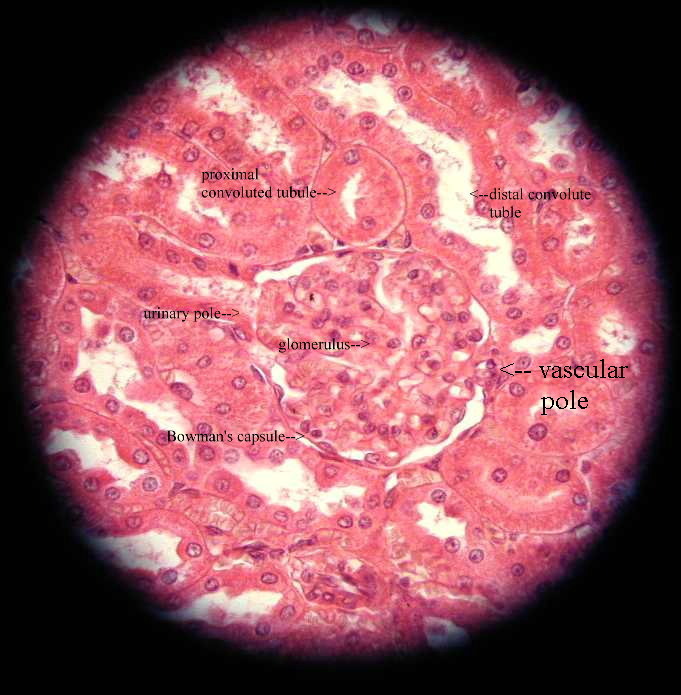 The hilus is the point at which the artery, vein and ureter attach to the kidney. Here is a labeled version of this image. Left kidney freed of fat, showing descending aorta, left renal artery, left renal vein, left gonadal vein and the left ureter. 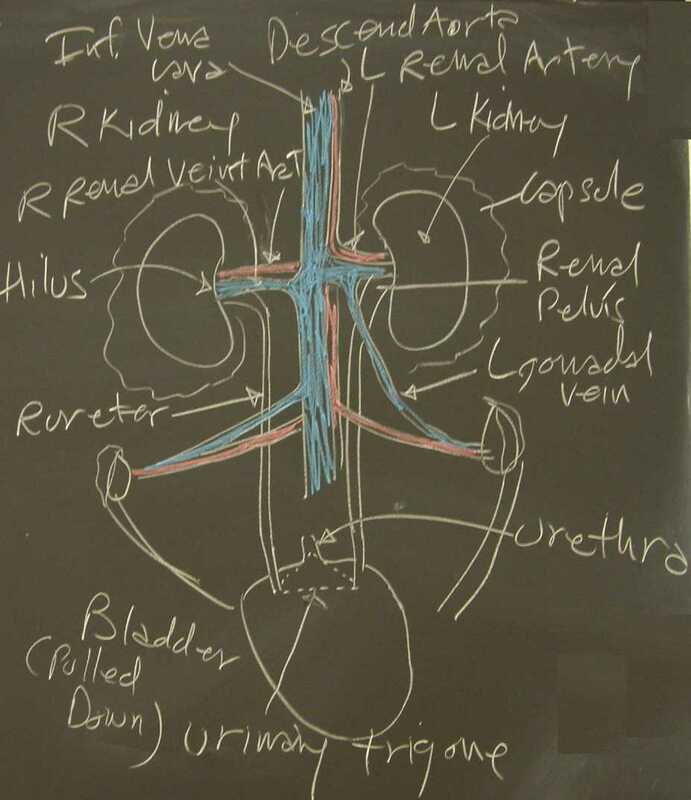 Overview of the left urinary system including the kidney, the renal vein, theleft gonadal vein, the R and L ureters and the bladder. Here is a labeled version of this image. Close up of the bladder with the R and L ureters, and the R and L vas deferens looping over the ureters. Pull the bladder towards the head, clear away the fat, and find the urethra. The urinary trigone is the triangle formed by the two ureters and the urethra. Cut the kidney mid sagittally and note. 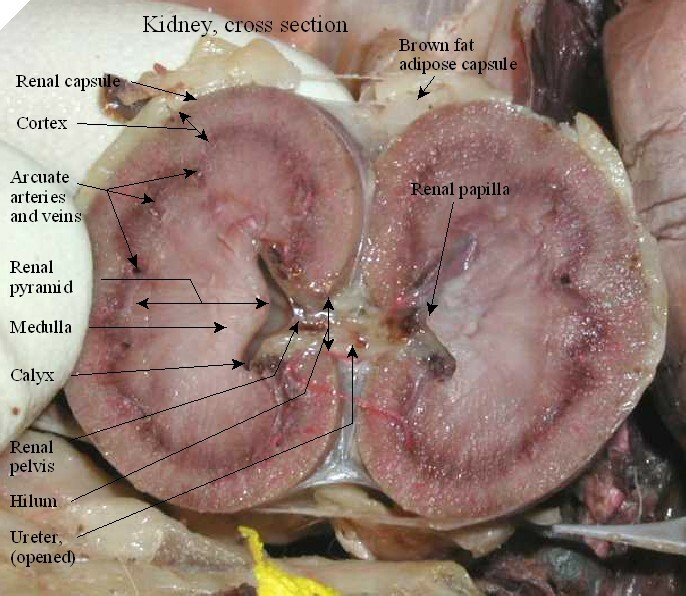 Here is a labeled view of the kidney cross section. See VITAMIN C TITRATION PROTOCOL for detailed directions on how to titrate for the quantity of vitamin C in a sample. 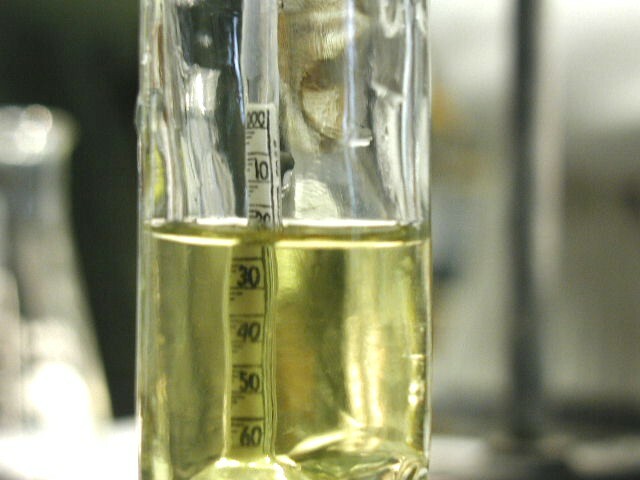 The same titration technique is use to measure vitamin C in aliquots of urine. The principle is to completely void your bladder and drink a full 12 ounces of water at time zero. At exactly one hour later, collect 100% of the urine produced during the preceeding hour, measure and record the volume, and titrate 10 mL aliqouts to determine the amount of vitamin C in 10 mL. When you multiply the vitamin C in 10 mL times the number of 10 mL aliquots in your one hour sample, you get the hourly excretion rate of vitamin C. Compare your excretion rate with those of your class mates. Look for correlations between diet, smoking habits, health, etc for possible explanations of high or low excretion rates. Here is a Vitamin C Excretion Rate data sheet into which you should enter your data. It will guide you through the steps and calculations. Here are class data collected which indicated a median excretion rate of 10.9 mg vitamin C/hour. Here is a pdf summarizing the interpretation of urinalysis and the list of activities which you are to perform to measure Vitamin C Excretion Rate. Here is a sample data page from a recent quiz. 1. Completely void the bladder at the beginning of the Lab, note the exact time to the minute. 3. Exactly one hour later, collect and measure all urine produced by completely voiding into a 400 mL beaker (more for some…). 4. Record the total volume produced. DO NOT DROP THE HYDROMETER INTO A DRY CYLINDER, THEY BREAK! 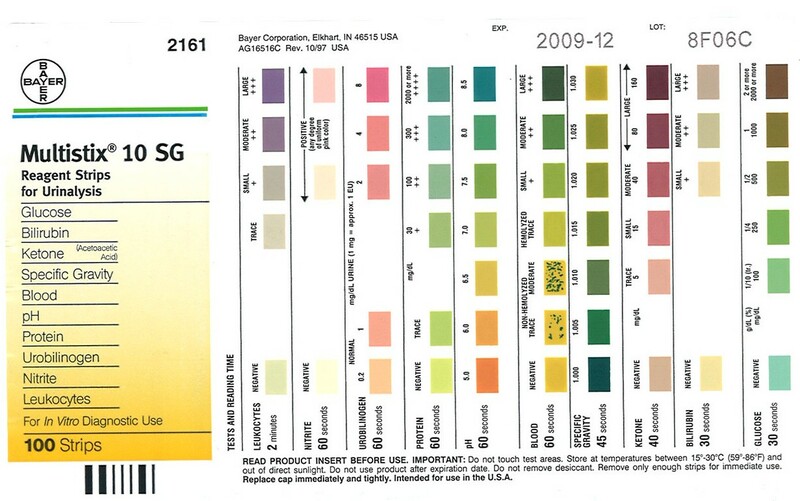 After recording the specific gravity, dip a urinalysis “Multistix 10 SG” strip into the urine, allow to sit for the prescribed time, and score and record the results based on this color chart. 6. 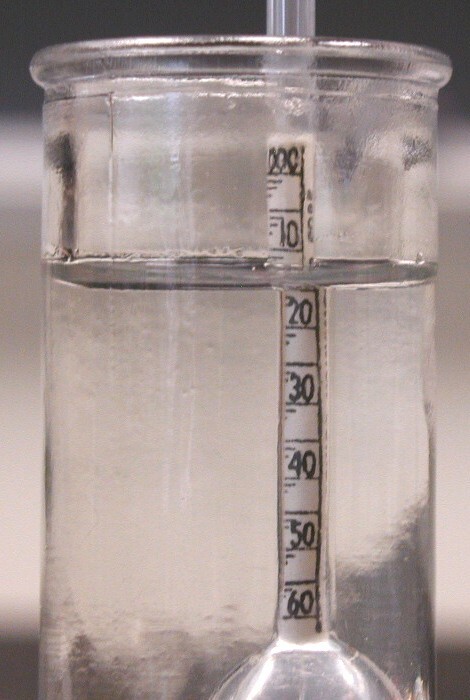 Titrate 10 mL aliquots of the urine in triplicate, carefully recording start and finish volumes for each, as given in the titration protocol. 7. Determine the average mL iodine required per 10 mL of urine, multiply times the conversion factor to yield the amount of vitamin C in the 10 mL aliquot. 8. Determine the number of aliquots produced per hour by dividing the total volume of urine produced in an hour by the aliquot size (10 mL). 9. Determine the total vitamin C excreted per hour by multiplying the number of aliquots in the hour’s sample by the Vitamin C per aliquot. 1. Place 10 mL of reaction mix in 250 mL flask, using a repipet. 2. Pipet in a 10 mL aliquot of urine into each of three flasks. 1. Follow the format for recording your data as demonstrated: Record the starting volume in the buret to nearest hundredth of a mL (remember that the graduations go from top to bottom of buret, the numbers increases as you go down, and that you read at the bottom of the meniscus). Before you begin each titration, judge whether you have enough titrant in the buret to finish the flask. When in doubt, refill the buret, and record the new start reading. 2. Place prepared flask of sample under spout. 3. Add titrant while simultaneously swirling the flask. Be cautious on the first flask, as it may take much less titrant than you anticipate. 4. When the color change begins to show while swirling, reduce the rate of titrant addition. Continue to reduce the rate as you approach the endpoint (color will take longer to disappear). 5. Begin adding titrant drop-wise, swirling to remove color after each addition. 6. Stop when a trace of blue is stable (hopefully after a single drop has been added). The blue color may fade after 10-15 seconds. Not to worry. 7. Record the finish buret reading to nearest hundredth mL. 8. Repeat this process for the second and third flask, using the finish reading of the previous flask for the start of the current flask. 2. Calculate the mean mg of vitamin C in 10 mL urine by multiplying the mean mL titrant used times the conversion factor for the iodine titrant used. 3. 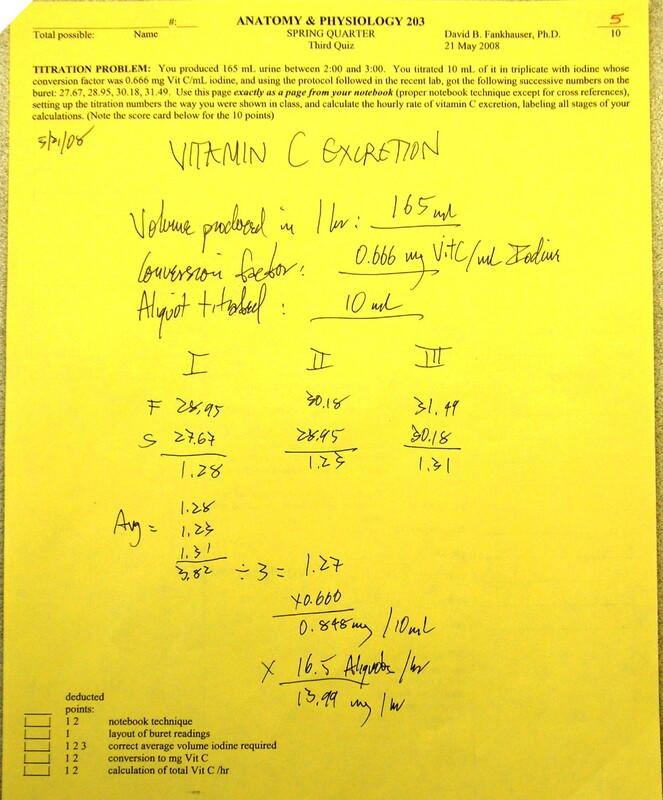 Calculate the mg vitamin C/hour multiplying the mg vitamin C/10 mL X (total mL urine produced in an hour)/10 mL aliquot volume. Close the stopcock. Close the stopcock on the buret. Use a funnel to fill the buret. CAUTION: Add only enough iodine to keep some in the funnel. If you over fill, it will spill all over your desk. Open the stopcock wide to flush the air out of the spout. If air reappears, pull off the stopcock, apply a thin layer of stopcock grease as a sealant, and replace the spout. There is no air in the spout. 1) Set the volume desired to be delivered. (either 10 mL for clear samples to be titrated, or 2x 7.5 mL for turbid specimens (fruit juice, etc). 2) Place a waste container under the spout. 3) Lift the grip all the way up, and press all the way down. Repeat until you get a steady stream of liquid (no bubbles). Discard the liquid. 4) Place the receiving container under the spout. 5) Raise the grip all the way up. 6) Press the grip all the way down as the liquid is delivered into the receiving container. Withdraw 1.00 mL of 1.00 % Vit C (corresponds to 10.0 mg of vitamin C). Deliver the 1.00 mL of 1.00% Vitamin C into each of three flasks to which reaction mix was previously added. Titrate the first flask with 0.01 N Iodine solution until the solution just turns faint blue. Repeat the titration for the other two flasks. 5. Read and record the finishing volume in the buret, also to the nearest 0.01 mL. 6. Repeat the titration for the other two flasks. 7. Determine the volume of iodine solution used in each titration, determine the mean volume required for the three flasks.